Lirac is situated on the right bank of the Rhone River, west of Chateauneuf-du-Pape between the towns of Orange and Avignon. 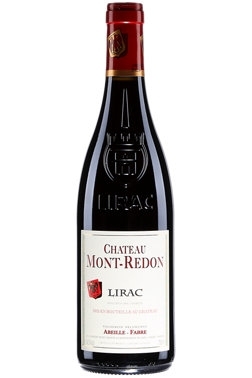 Chateau Mont-Redon's 35 hectares of vineyards are located on a plateau with soils of sand and pebbles, similar to nearby Chateauneuf-du-Pape. Summers are dry and hot with the warm Mistral winds keeping away any humidity. Grapes are selected and hand harvested beginning in early September. Upon arrival at the winery they are destemmed and macerated at cool temperatures for a period of two to three weeks. Punch down of the cap is frequent to ensure maximum color and extraction. With fermentation complete approximately 1/3 of the wine is aged for a short period in small oak barrels with the remainder remaining in large vats. The wines are then blended and aged for an additional 18 months prior to bottling.